We’ve all sat on the beach with a long lens shooting the waves as they lap against the shore. But have you ever run into the sea with your camera in your hands? That’s not as crazy as it sounds. With a waterproof bag for your D-SLR you can keep your pride and joy dry while hopping in the water and photographing inside a wave. It’ll be tricky to look through the viewfinder underwater, if at all, so periodically move back towards the beach and double-check your composition. Try working with the rule of thirds, or if there’s a bit of seaweed, stick it in the centre of the frame for a symmetrical shot. On a shoot like this, weather isn’t as important as tidal swell and wind speed/direction. To find out the size of the surf in your location use the website magicseaweed.com (or the MSW smartphone app) – it’ll tell you the size of waves you can expect over the next week or so. If the weather is good and you just want to have a play with your camera, pop some old shorts and a T-shirt on, but if the weather is bad, or you’re taking things a bit more seriously, you’ll be much more comfortable in a wetsuit. Renting one costs about £10/$20 a day. Keep your camera dry by putting it in waterproof housing. Dedicated D-SLR waterproof housing can cost thousands, whereas a waterproof D-SLR bag costs between £50-£100/$75-$150. We recommend testing the bag without the camera before starting out. Select AF-C in the autofocusing menu (hold down the AF button and turn the command dial until AF-C is displayed). If you find that it isn’t hitting the mark, put your lens into manual focus and preset the focus to around one to two metres to get the first part of the wave nice and sharp. In aperture-priority mode, set an aperture of f/13 to maximise the depth of field and get as much of the scene in focus as possible. Set continuous burst drive on your camera. 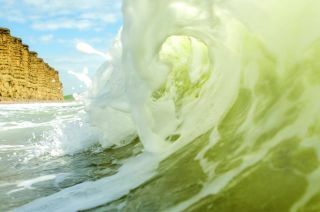 Choose an ISO between 400-800 to ensure the camera chooses a fast shutter speed to freeze the wave. In the Playback menu, under Playback display options make sure Highlights is ticked, then navigate to a photo and use your multi selector to check for clipped highlights – clipped areas will flash. We dialled in -0.67 stops of exposure compensation for this reason.